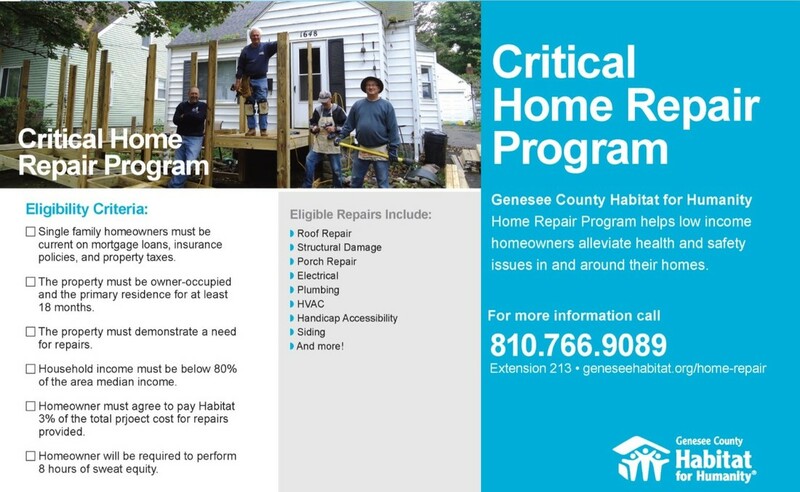 As an indelible extension of our mission to build homes, communities, and hope, Genesee County Habitat for Humanity provides critical home repair services to homeowners in the City of Flint, and military veterans county wide. Eligible repairs include anything that is health or code related such as: roofs, structural damage, porch repair, electric, plumbing, HVAC, handicap accessibility, siding, exterior paint, weatherization, or energy efficiency depending on available funding. Income eligibility for all our programs is based on the current Department of Housing and Urban Development's - Area Median Income (AMI). Click Here for more Information. See the program application below for a full list of eligibility criteria and program requirements. The Premise Plumbing Investigation Program, in partnership with United Way, Department of Environmental Quality and the Plumbers Union, helps homeowners safeguard against the negative effects of the Flint Water Crisis. ​A Habitat representative will visit your home to perform a preliminary water test. If lead levels exceed 15ppb, the homeowner will be provided a sample kit to drop off at City Hall, which will be submitted to the Department of Environmental Quality (DEQ). If submitted sample still exceeds 15ppb, actions will be taken to resolve the issue, including fixture, or full plumbing replacement where necessary. Households below 50% AMI may also qualify for water heater replacement through G-CARD Call 810-787-0199 for more information on G-CARD's Water Heater Replacement Program. Here are some of the programs that we regularly partner with or refer people to. Click on the agency title for more information.